Social enterprises are important in both their innovative ideas they bring to the social economy and their ability to remain sustainable with limited resources. However, obtaining these resources and having adequate financial planning are fundamental for social enterprises to become a reality. The most important aspects of funding for social enterprises come from the ability to develop financial plans and procure financing for starting up the enterprise itself and maintaining financial sustainability once they obtain funding. Several sources of funding from institutions around the country and financial services dedicated to helping obtain this funding are important in securing a financial hold for the social enterprise in our current economy’s limited resource environment. 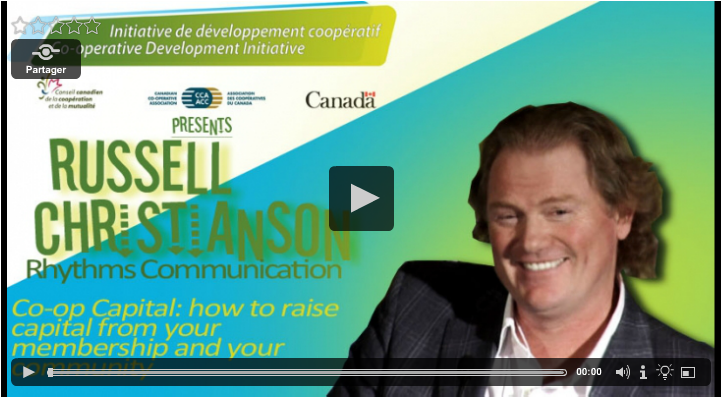 This section offers a wide variety of information, links, and resources designed to help get you started in thinking about funding for both starting up and sustain your social enterprise. Procuring Funding offers information and guidelines on procuring funding and developing a financial plan that works with the social enterprise’s organizational and budgeting goals. Maintaining Financial Sustainability provides a great variety of information about maintaining a social enterprise’s financial sustainability including strategies for long-term sustainability, fundraising, income and asset analysis, contracting and support from the public sector, and the benefits of local currency systems. Sources of Funding provides several resources from organizations and institutions that provide different sources of funding including loans, micro-credits, grants, fellowship/scholarships, and venture capital investments. Financial Services and Consultation offers several resources that can help social enterprises obtain the financial consultation and services they might need to secure funding and remain sustainable. 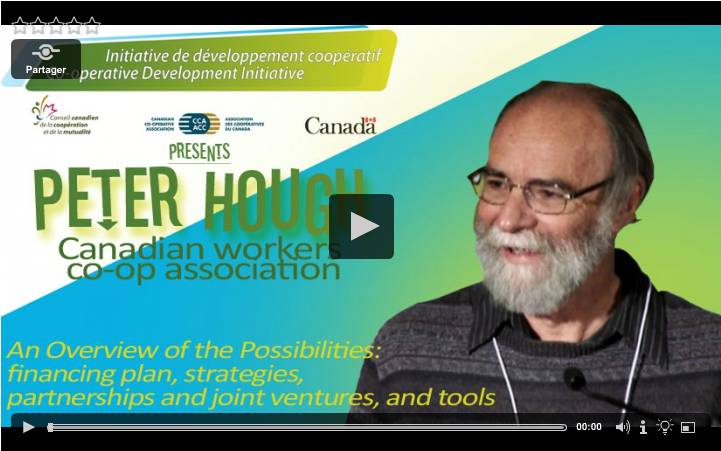 This video features Peter Hough of the Canadian Workers Co-op Association and his address to the Co-op Capitalization Panel at The Co-operative Development Initiative 2011 conference. Hough discusses capitalization and how to garner financing in order to develop and operative your cooperative for the long term. 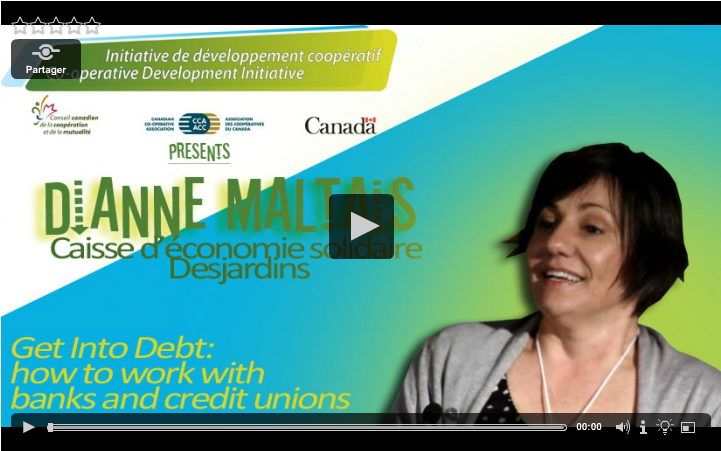 Diane Maltais addresses the Co-op Capitalization Panel at The Cooperative Development Initiative 2011 conference regarding debt. Specifically, she discusses how going into debt is often unavoidable when developing a cooperative and how to work with banks and credit unions during this process. This section offers resources with advice on financial planning and budgeting that are necessary to complete the goals of the social enterprise. These financial resources pertain to social enterprises of all kinds including small business cooperatives and not-for-profits with information on allocating financial resources, the principles of budgeting and financial management all related to financial decision making and planning. Maintaining financial sustainability is important to keep the social enterprise running and utilize their available funding for maximum capability. This section offers several resources on maintaining financial sustainability including strategies for long-term sustainability, fundraising, income and asset analysis, contracting and support from the public sector, and the benefits of local currency systems. Creating a Cooperative Community Fund This FAQ, sponsored by Twin Peaks Cooperative Foundation in California, helps co-ops learn more about the potential of the Cooperative Community Fund program. A Cooperative Community Fund (CCF) is an endowment fund established for each participant co-op wherein the interest earned each year is donated by the sponsor co-op to nonprofits and cooperatives in their community. As Twin Pines Cooperative Foundation and local co-ops build the Cooperative Community Funds, they directly invest the principle in cooperative development by investing in credit unions, locally owned community banks that support cooperatives, the Northcountry Cooperative Development Fund, the National Cooperative Bank and other socially responsible funds. Social Enterprise and Public Sector: A Practical Guide to Law and Policy. This extensive guide funded by the European Union identifies opportunities for the public sector to do more business with social enterprises and the main ways that the public sector promotes it. The guide itself has several examples and references to the United Kingdom but many of the ideas are relevant as introduction to key issues social enterprises face all over the world. The guide is split into five parts with several sub-sections each involving issues related to public sector and social enterprise involvement including procurement issues, political agendas, contracts, and legal issues. For the purposes of this section, our website will focus on specific topics that talk about contracting with the public sector and the legal issues that might arise from it. Sections 10 (Developing the Social Enterprise sector) and 12 (Supply Chain Development) of the guide offer information on which ways the public sector can promote and develop social enterprises through a variety of opportunities but also considers the risks and responsibilities of engaging in these contracts. Sections 13 (Contracts), 14 (Property Law Issues), and 15 (Tort) of the guide offer advice for social enterprises pertaining to these different laws and the risk assessment and careful planning they should take to avoid finding issues in these areas. The full PDF can be found here: Social Enterprise and the Public Sector. Support for Developing Social Enterprises within the Obama Administration In creating the Office of Social Innovation and Civic Participation (SICP), housed within the Domestic Policy Council, President Obama recognized that the best solutions to our challenges would be found in communities across the country. He tasked SICP with engaging individuals, non-profits, the private sector, and government to foster innovation and work together to make greater and more lasting progress on our Nation’s challenges. The Office is focused on doing business differently by promoting service as a solution and a way to develop community leadership; increasing investment in innovative community solutions that demonstrate results; and developing new models of partnership. Community Solutions Initiative The SICP will focus on three mission areas that comprise a bottom-up, innovative, and results-oriented “community solutions” agenda. To deliver on this agenda, we will marshal the power of service, social innovation, and partnerships to solve our most pressing challenges. Across the Administration, federal agencies are acting on this agenda. This page serves as a place to learn more about initiatives the Administration is embarking on that reflect each of the Office’s mission areas. While each initiative is listed under a mission area, many are cross-cutting, including elements of two or all three of the mission areas. Innovation Funds President Obama is committed to supporting innovation that will help achieve more transformative change — as opposed to marginal or incremental progress — on our social problems. At the same time, we recognize that limited taxpayer dollars need to be directed at efforts that have evidence that they work and are ready to serve more communities in need. Across the government, the Obama Administration is creating structures and driving resources to create a policy climate that will promote more innovation and better results. The Obama Administration has created the Social Innovation Fund and the Investing in Innovation (I3) Fund to provide resources to organizations who are inspiring innovation and economic sustainability. Local currencies are a system of currency tailored specifically for a local community in order to promote local economic activity through consistent circulation and reinvestment of local resources. It creates economic strength, local self-reliance, community participation and awareness of resources and products created in the local community to outsiders. This section contains resources for several local currencies, but we encourage you to please check out the Ithaca Hours located below for an explanation of the local currency system from one of the best known and longest standing local currency system’s in the U.S. In addition, please also check out Transaction Net (also below) that gives a list of local currencies and provides more information on their benefits and use. Ithaca Hours Features: This site both explains the local currency system approach pioneered in this small upstate NY town and provides links or contact information to many other systems. Ithaca Hours is the longest running local currency in United States that helps Ithaca, NY to improve economic strength, local self-reliance, social justice, ecology, community participation and human aspirations. Stephan Burke, Board Member, describes that the purpose of Ithaca hours was to circulate money within the community instead of taking money away from the local community and investing elsewhere. Transaction Net: Complementary Community Currency Systems Features: Offers extensive information on local exchange networks and complementary currency. Explains the benefits, how it is issued, how it is measured, as well as the exchange rates for these currencies. E.F. Schumacher Society Features: Current news, a description of their local currency project and links to other resources. This site also has information about community land trusts. Time Dollar Institute Features: Information about the concept of Time Dollars and descriptions of various local experiments in implementing the idea. Cascadia Hour Exchange (CHE) Features: Seeks to enhance the services between CHE participants through a variety of resources. Their values include ethics, integrity and standards all developed for deep trust in one another. They reinforce the idea that local currency is the key to urban sustainability and global accountability. This section offers several resources for both local and national institutions that are involved in supporting the social economy. These resources provide funding to social enterprises in different types of ways including loans, micro-credits, grants, fellowship/scholarships, and venture capital investments. CoBank is a national cooperative bank serving the industries of rural America. They provide loans, leases and other financial services. Ohio Cooperative Development Center provides multiple seed grants for a variety of growing and existing cooperatives. Some of the grants available are for feasibility study, formation studies or implementation studies. Opportunity Fund provides working capital for working families. They provide funds to help control housing costs, making informed financial decisions, building savings plans, accessing appropriate credit and gaining access to affordable healthcare, childcare and education. Worker Ownership Fund The Worker Ownership Fund (WOF) is a national fund managed by Northcountry Cooperative Development Fund (NCDF) on behalf of the U.S. Federation of Worker Cooperatives (USFWC), to increase access to financing for start-up and existing worker-owned cooperatives. NCDF and the USFWC understand the business structure of worker-owned cooperatives in a way that traditional lenders can’t, and not only offer a new financing option for co-ops, but technical assistance and mentorship so that cooperatives can better develop a viable business plan and loan application. CoBank CoBank has been a leader in delivering financial solutions since 1916. They offer loan programs, financial services, and leasing services to agribusinesses, rural communicators, energy systems, and Farm Credit Associations. CUNA- Credit Unions The Credit Union National Association (CUNA) is the premier national trade association serving credit unions. Ninety percent of America’s credit unions are affiliated with CUNA. CUNA provides many services to credit unions, including representation, information, public relations, continuing professional education, and business development. CHS Foundation The CHS Foundation invests the future of rural America, agriculture and cooperative business through education and leadership development. Programs offered include Scholarships, Rural Youth Leadership Development, Returning Value to Rural Communities, Cooperative Education, Farm and Agricultural Safety, Emergency Assistance and Disaster Relief. National Credit Union Administration (NCUA) NCUA is the independent federal agency that regulates, charters and supervises federal credit unions. With the backing of the full faith and credit of the U.S. government, NCUA operates and manages the National Credit Union Share Insurance Fund, insuring the deposits of more than 90 million account holders in all federal credit unions and the overwhelming majority of state-chartered credit unions. They work to make ensure that the Federal Union Credit Act maintains its purpose to make credit available and promote thrift through a national system of nonprofit, cooperative credit unions. National Cooperative Bank and NCB Development Corporation NCB is the only bank in the United States dedicated to delivering nationwide banking products and solutions to cooperatives and other member-owned organizations throughout the country. NCB is unique because the bank was created to address the financial needs of an underserved market niche – people who join together cooperatively to meet personal, social or business needs, especially in low-income communities. Cooperative Fund of New England Cooperative Fund of New England is a community development loan fund that links socially responsible investors and cooperatives, community oriented non-profits, and worker-owned businesses. SCF Arizona and Chicanos Por La Causa are teaming up to create the SCF Arizona Community Jobs Investment Program, aimed at growing jobs in under-served, rural areas of Arizona by establishing a $10 million loan fund available to small businesses that seek to start or expand their business. This is a relatively new loan program that will expand access to capital for rural small businesses in Arizona. Program officials estimate most of the loans, lent at current market rates, will be made in the $150,000 to $300,000 range and will be used by small businesses outside Maricopa County and Metro Tucson to expand, acquire business property, buy equipment or update their existing businesses. Seed Spot is a nonprofit incubator focused on developing early stage social entrepreneurs in Arizona through support, mentorship, and guidance. Each year, from July 1 through August 30, entrepreneurs who are committed to social change are invited to apply for the program. Selected entrepreneurs are given office space and opportunities to secure capital, among additional benefits. Micro-credit is a system of loans that are made to those who want to become social entrepreneurs but lack the financial needs to do so. Originally started by Mohammad Yunus in Bangladesh, it was to help alleviate poverty by allowing low-income or poorer individuals to obtain financial services in order to generate income and become self-employed. Today it has become an increasingly popular system all over the world for those who wish to continue helping their communities and promote the social economy. Below are resources dedicated to micro-credit and micro-finance both in Arizona and across the United States. The following video, titled Pioneering for Social Change, describes the origins of microfinance and features Nobel Prize winner Mohammad Yunus discussing his effort in the field of microfinance in Bangladesh and other leaders in the social entrepreneurship field. PPEP Micro Business & Housing Development Corporation (PMHDC) is located in the Tucson area, provides assistance to microenterprises and is committed to helping new and existing business owners to reach their dreams of self-sufficiency by providing training, one-on-one counseling, and business lending. Prestamos is a subsidiary of Chicanos Por La Causa Inc. based in Phoenix. It lends SBA-backed microloans with an average loan size of $35,000. Préstamos is committed to building stronger communities by providing small businesses access to capital through non-traditional small business financing resources. California Association for Microenterprise Opportunity (CAMEO) is a statewide association of organizations, agencies, and individuals dedicated to furthering microenterprise development in California. KIVA is a non-profit organization with a mission to connect people through lending to alleviate poverty. Kiva works with microfinance institutions on five continents to provide loans to people without access to traditional banking systems. Leveraging the Internet and this worldwide network of microfinance institutions, Kiva lets individuals lend as little as $25 to help create opportunity around the world. FINCA provides financial services to the world’s lowest-income entrepreneurs so they can create jobs, build assets and improve their standard of living. Reaching over 800,000 clients in 21 countries, FINCA seeks to be global microfinance network collectively serving more low-income entrepreneurs than any other MFI while operating on commercial principles of performance and sustainability. Accion International is a private, nonprofit umbrella organization for microfinance institutions across the US and Latin America. They specialize in providing technical assistance, financial planning, policy research, analysis and publication help for microfinance institutions. Arizona Community Foundation Funding from the Arizona Community Foundation and affiliates is awarded year-round to a wide range of community organizations, educational institutions and government agencies, through competitive, advised and designated grants, and through scholarship awards. Roberts Enterprise Development Fund (REDF) is a San Francisco-based venture philanthropy organization that invests in social enterprises. Since 1997, REDF has provided funding and business assistance to a carefully selected portfolio of social enterprises that employ young people disconnected from school and work, and adults who are overcoming barriers to employment. Organizations in their portfolio are able to expand their enterprises, achieve sustainable success and measure the positive impact of their work on people and communities. Ohio Cooperative Development Center (OCDC) Since it began in 2001, OCDC has assisted in helping groups form cooperatives and assisted existing cooperatives grow and strengthen. The OCDC offers Seed Grants for cooperatives to start and expand their cooperative. Seed grants can assist cooperatives in paying for legal or accounting services as a pre-formed cooperative or for marketing and management dollars as an established cooperative. USDA Rural Development Cooperative Program Rural Cooperative Development grants are made for establishing and operating centers for cooperative development for the primary purpose of improving the economic condition of rural areas through the development of new cooperatives and improving operations of existing cooperatives. The U.S. Department of Agriculture (USDA) desires to encourage and stimulate the development of effective cooperative organizations in rural America as a part of its total package of rural development efforts. Social Innovation Forum Andrew Wolk, the CEO and founder of RootCause has developed an innovative social enterprise financial program titled Social Innovation Forum. To address the challenge of having to compete for limited funds, the Social Innovation Forum gives innovative nonprofit leaders access to the resources they need to accelerate their impact, while also helping them to build skills vital to their organizations’ long-term sustainability. In the long term, the Social Innovation Forum strives to provide an alternative to the way resources currently flow in the social sector, so that those with resources will invest and re-invest in organizations that have demonstrated the greatest success in solving social problems in our neediest communities. For more information on the Social Innovation Forum, including its creation, how it works and its future potential, please view the following PDF file: Wolk -The Business of Social Change. This section offers several resources that can help social enterprises obtain the financial consultation and services they might need. These services range from helping businesses start up or helping them to remain financially sustainable in order to address the challenges and needs that are present in today’s economic environment. National Association of Federal Credit Unions (NAFCU) is a respected and influential trade association that exclusively represents the interests of federal credit unions before the federal government and the public. NAFCU provides its members with representation, information, education, and assistance to meet the challenges that cooperative financial institutions face in today’s economic environment. The association stands as a national forum for the federal credit union community where new ideas, issues, concerns and trends can be identified, discussed, resolved.